The term 'hygge' could be the secret as to why Danish people are so happy. 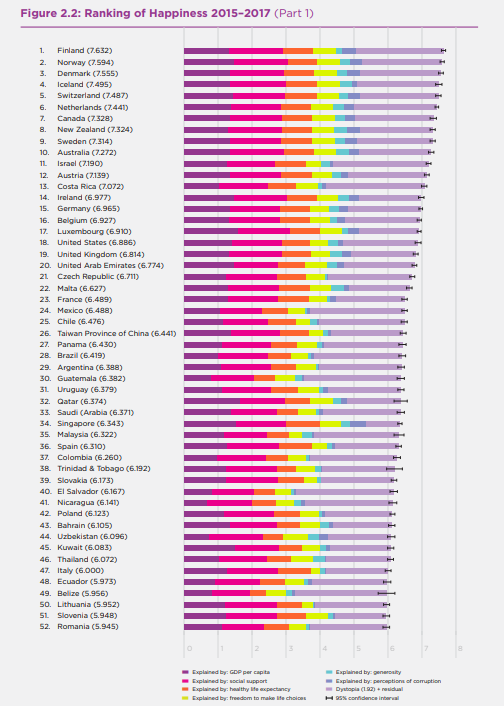 The new World Happiness Report again ranks Denmark among the top three happiest of 155 countries surveyed – a distinction that the country has earned for seven consecutive years. The U.S., on the other hand, ranked 18th in this year’s World Happiness Report, a four-spot drop from last year’s report. Yes, Danes have a stable government, low levels of public corruption, and access to high-quality education and health care. The country does have the the highest taxes in the world, but the vast majority of Danes happily pay: They believe higher taxes can create a better society. It would be fair to say that hygge is fully integrated into the Danish cultural psyche and culture. But it has also become a bit of a global phenomenon – Amazon now sells more than 900 books on hygge, and Instagram has over 3 million posts with the hashtag #hygge. Google trends data show a big jump in searches for hygge beginning in October 2016. In the U.S. – which also places a high value on individualism – there’s no real cultural equivalent of hygge. Income is generally associated with happiness; yet even though the country’s GDP has been rising and its unemployment rates have been declining, levels of happiness in the U.S. have been steadily decreasing. Income inequality continues to be an issue. But there’s also been a marked decrease in interpersonal trust and trust toward institutions like the government as well as the media. In the end, more disposable income doesn’t hold a candle to having someone to rely on in a time of need (something that 95 percent of Danes believe they have).